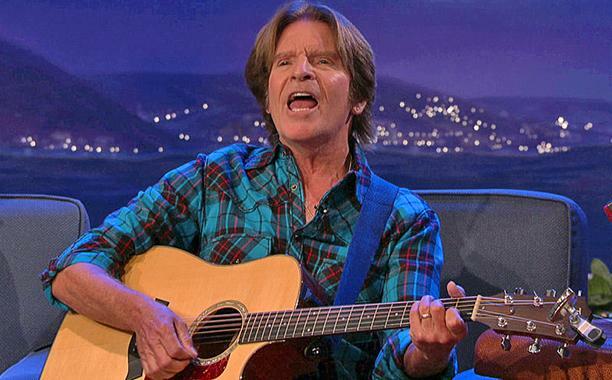 John Fogerty delivered an impromptu acoustic performance of his Creedence Clearwater Revival classic, “Have You Ever Seen the Rain?”, on TBS late night show Conan on Monday. The only single issued from the group’s 1970 album, “Pendulum”, the tune peaked at No. 8 on the US Billboard Hot 100 chart. Fogerty is making the rounds to promote his newly-published memoir, “Fortunate Son: My Life, My Music”, which sees the rocker explore his Northern California roots, CCR’s success and his retreat from music and public life before returning to chart-topping solo success. Fogerty also shared stories about his start as a songwriter and CCR’s appearance at the 1969 Woodstock festival, where the group followed The Grateful Dead. The rocker will play an 8-show residency at The Venetian Theatre in Las Vegas in the New Year.